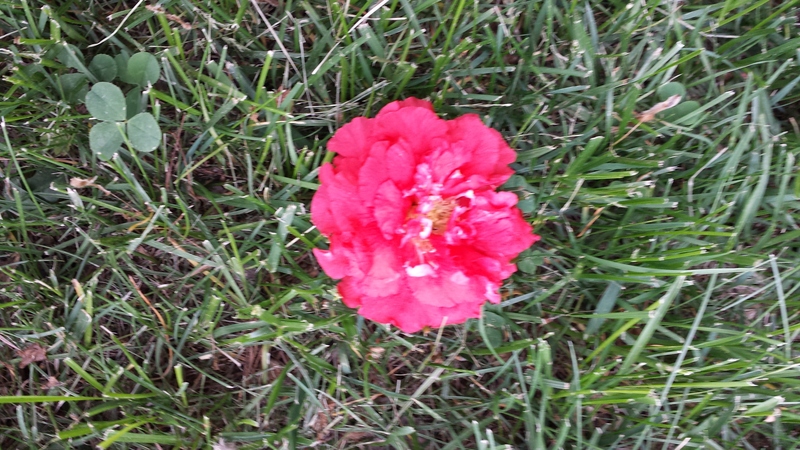 Despite some unusual heat this May, the lack of rain has slowed down both the growth and the flowering in my yard. It’s been a very strange season. 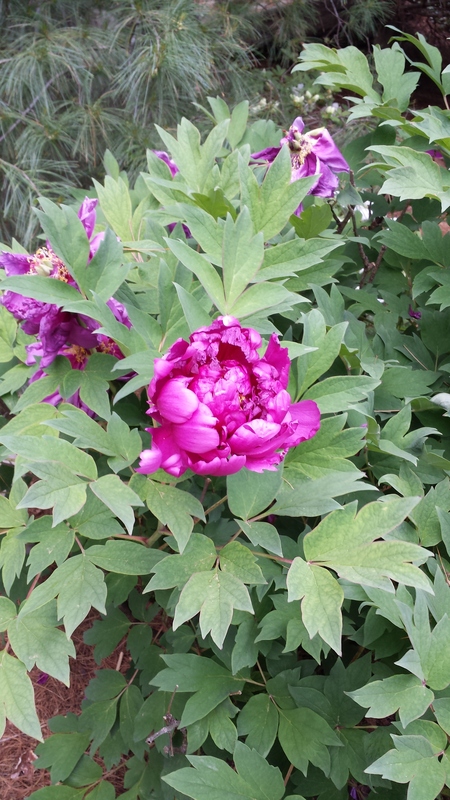 Nevertheless, certain things are still blooming–with more to come in June I hope! 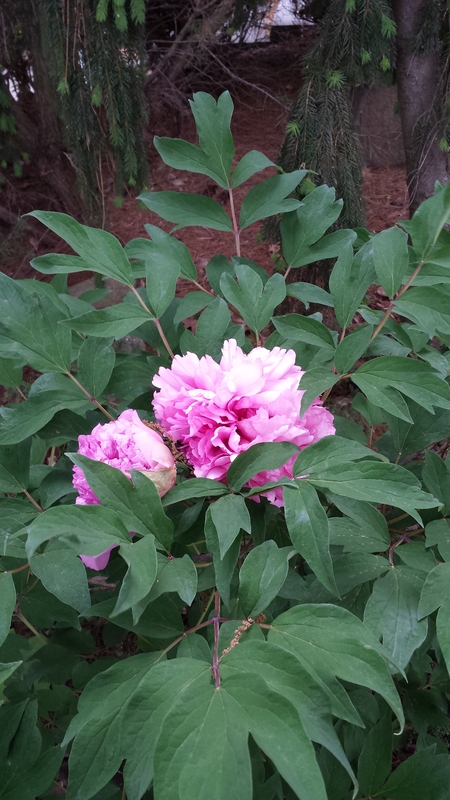 Here’s one of my tree peonies. This one is on the north side of our Japanese style garden so it hasn’t fried in the unseasonable heat. The one on the south side, which I’ll show in a minute, usually lasts for 20 minutes because its bloom always corresponds to a heat wave. Here’s the bush on the south side. You can see the blooms behind this one already well past. Don’t ask about variety. These were here when I married the house and the Spoiler has no idea. 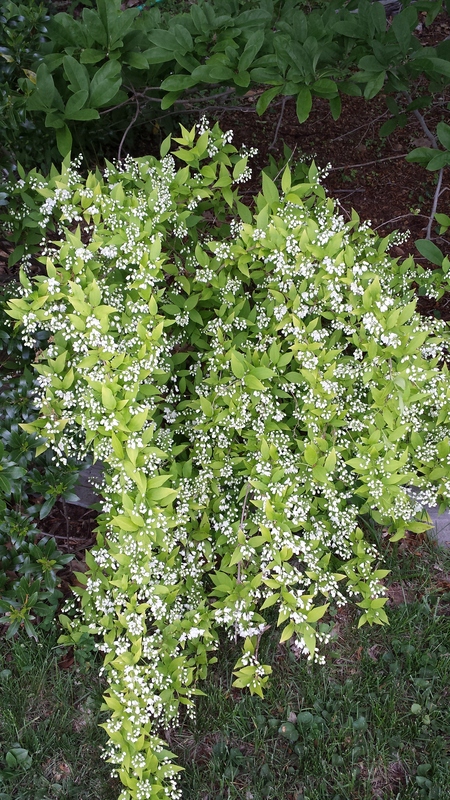 This is one of my favorite little shrubs. It’s a dwarf deutziz called Chardonnay Pearls. It’s just at the beginning of its bloom, when the buds do look like pearls. I love it. The flower is from one of those new thornless quinces. This is the Double Take Scarlet. I’ve also got the orange. The reason I’ve got it in the grass is that the flowers are so buried in the shrubbery that they are almost invisible. Who wants that? I may just take them out. I have too little sun to waste on that sort of thing. 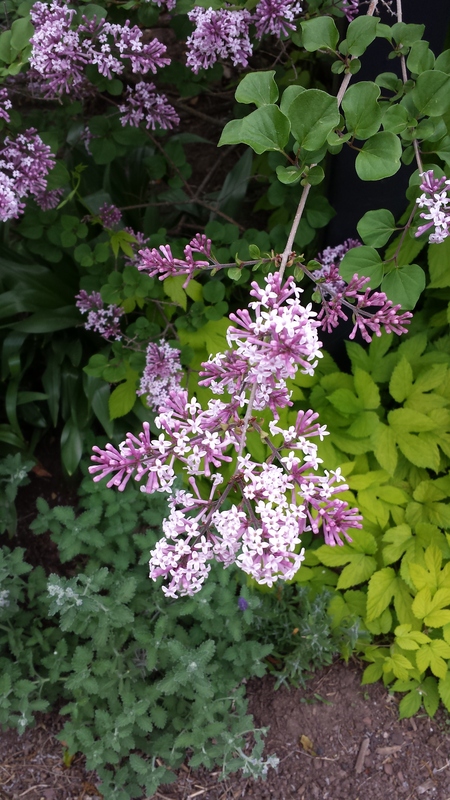 Finally, one thing I’d never dream of parting with is my dwarf Korean lilac “Paliban.” It’s just beginning to open and already it’s incredibly fragrant. The flowers also pair nicely with the foliage of the catmint and ornamental hops that I’ve got growing below. What’s not to like? As the lilac finishes blooming, the catmint will take over. And this is all in a rose garden. This is one colorful garden! Oh thanks. I wish I’d come up the the “freedom lawn.” It’s been around quite some time–I caught onto it somewhere reading some sustainable publication or other. I think the Yale forestry school actually came up with it in the 90s–way before anyone was really thinking about this sort of thing. But it’s the perfect name for it!